My heart belongs to cats. I do what I can for them, but it’s never even a drop of sand–even with all the others helping cats in this world–against the flood of irresponsibility and cruelty on the part of humans toward cats (and other animals). I feel so badly for the poor cat the farmer shot. He must have been so terrified and was doing his feral tom cat thing. Sometimes there is no right choice in dealing with animals because of the impossible situations that humans have created. And the other cat mystery is why a cat will head straight for the non-cat person (me) in the room! Have you had a chance to see https://en.wikipedia.org/wiki/A_Street_Cat_Named_Bob_(film) ? Radio NZ gave it a very good review. Actually I am only a non cat person because I am allergic to them. I love them from a distance and I love stories about them, and their mysterious ways. Hello Amanda, good to see you.. Yes, I know what you mean about the non-cat person syndrome – have seen it time and again ! I’m so glad that you weren’t more seriously injured, but sorry your cardigan didn’t fair quite so well. Our last cat, meant to be a comfort to our youngest while his father was off serving in the Navy, had to be put down a few years back. Shyler was 18 years old and spent her last days either on my lap or behind me in my desk chair. They say that you dogs have owners and cats have staff. Having had both pets at various time, I think that’s true. Currently we have no furry pets which is fine since my latent cat allergies have resurfaced over the past four or five years. I always enjoy your stories. This was no exception. BTW, it’s neither here nor there, but Mr. Heinlein came from my hometown of Kansas City, Missouri. As you say, such a difference between cats and dogs.. In my first blog, I wrote that I always wondered why I was so grateful for my cat’s love, compared with the way my dogs loved me ! You are always so generous about my writing – thank you…and I will pass on your information to the resident Heinlein fan in case you haven’t already !!!! I love cats! And dogs! and Horse! and Cows! Well, you understand. So do I – and tigers and elephants and lions and donkeys … this reminds me of my grandchildren… every Christmas we had a party just for them at my place, and we’d get out their notebooks in which every year they’d record their height, hair colour etc, etc, including their favourite food, favourite book, and above all, favourite animal , and that would take ages as their lists grew longer and longer… oh – and hedgehogs… and oh and badgers… mm, oh moles… what about squirrels… and wolves…giraffes…you get the picture…!!! I do! The love of all creatures great and small. I love cats too and always had at least one, sometimes 5 or 6 as I was growing up but since our children left home we haven’t replaced the last loved feline. I do love your stories, your food for thought and your delicious meal suggestions. Tomorrow is International Day of Happiness so I plan on using that brilliant quotation from Elizabeth von Arnim. Thank you! Am fascinated that you’re using the Elizabeth von Arnim quote… some lovely synchronicity going on here… I found that quote – when I was actually looking for the first sentence of her autobiography which I remembered began with a wonderful remark about dogs to use in my blog,but I couldn’t find it. Then that night we watched an old film called Enchanted April, and when I googled it afterwards, found the story had been written by E.von Arnim… now you too. !! Have a happy day of happiness – it’s really rather perfect, isn’t it !!! Pretty much an unspoken rule on our road in the Sounds not to have cats because of the bird life (wekas, etc, don’t stand a chance against cats), although there’s the very odd one. I like all animals, but am looking after the birds. It’s taken me a long time but I’ve slowly convinced our Daisy Dog not to chase the birds. All creatures big and small warm my heart for their gift of being able to take the edge off the worst of bad days. We’re all in the same boat, aren’t we? 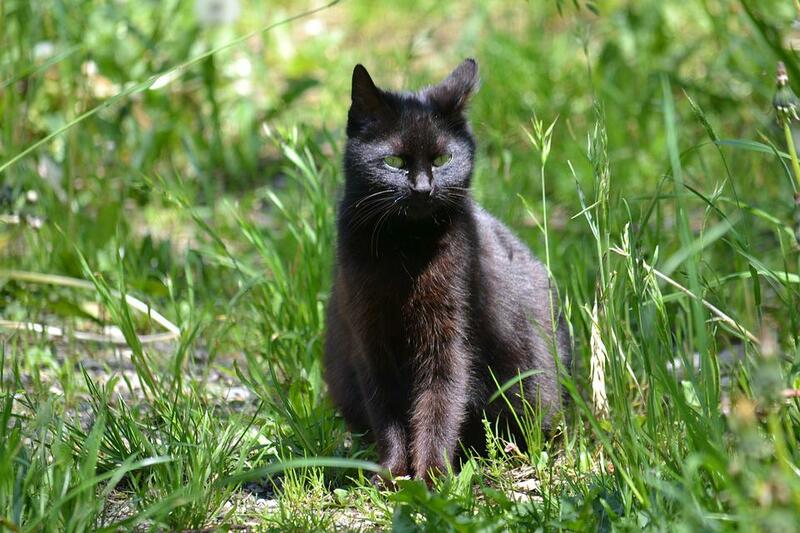 Love your photograph of the gorgeous black cat with the fabulous green eyes. Wonderful! The pic is my darling Cara… my witchy black cat !!! IT took me ages to get over our parting…hope she’s waiting for me – you know where!!! I always love when you write: “but that’s another story.” That means there will be other wonderful posts, just like the one I read this morning. I’m sitting in Starbucks across from “Petsmart” – a delightful boutique catering to our four-legged and winged friends. I enjoy the interactions that occur around this store. We owe a great deal of gratitude fellow creatures that walk our world. They offer loyalty, friendship and a link to a world that continues to be a mystery.